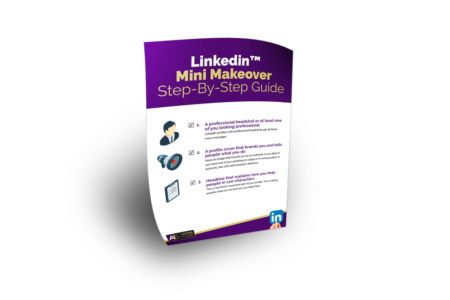 The LinkedIn Mini Makeover Step-By-Step Guide To Help You Land Your Next Big Deal in One Week or Less! GET MY MINI MAKEOVER NOW! The 3 critical things you need to do on your LinkedIn profile to go from being "invisible" on LinkedIn to having an irresistible profile that speaks to your ideal client and gets them wanting to do business with you! How to make the best first impression to immediately get 21x more profile views! How to set up a professional banner yourself in 10 minutes that attracts your ideal client without hiring a graphic designer (with quick video)! How to write your headline (pick-up-line in 120 characters) that tells your ideal client what problems you solve in 10 seconds! How to brand yourself professionally without paying for high-quality images or design so that you can charge more for your products or services. BONUS: Access to closed LinkedIn Rainmakers Facebook Group where you can post your progress and get our feedback! Where Can We Send This To?